“Dr. 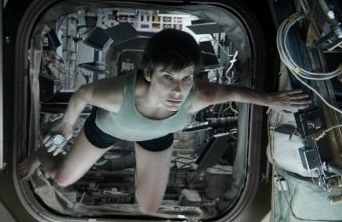 Ryan Stone” (Sandra Bullock) is a gifted engineer on her first real shuttle mission. Viewing earth from such a breathtaking vantage point that so many humans can only dream of, it seems like the perfect isolation for a place to clear your head. Stone’s commanding officer is a veteran astronaut, “Matt Kowalsky” (George Clooney). All that seems to matter is the sometimes-inconsequential banter from the two of them, together with Voice Command (Ed Harris). They betray the common characteristic personality trait that most astronauts have—a charming combination of wit, humor, and lightheartedness. On this seemingly ordinary spacewalk, calamity strikes when they and two other astronauts with them encounter a rogue debris field that destroys their vessel and renders them helplessly adrift in open space. Is there a more justifiable time to give up and lose all hope than this? At least it would be a peaceful – if lonely – way to die. 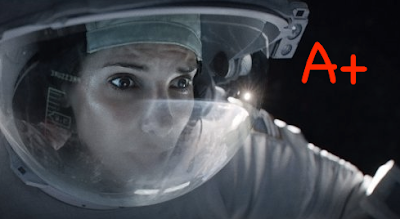 I can tell you without spoiling anything that what doesn’t die is the suspense brought on by Alfonso Cuarón’s Gravity. Cuarón (Children of Men, Harry Potter and the Prisoner of Azkaban) takes the fear of utterly losing control and turns it up a notch in a movie that masterfully utilizes three factors: character development, suspense, and that nightmare-like fear of being unable to navigate out of the way of danger. It’s like I’m stuck in water in my nightmares and can’t get away from whatever is chasing me. I got the same feeling from watching this. Gravity has as much respect for gravity as it does all other scientific laws. The more scientifically-minded viewers are given a treat in that the props and physical effects are so carefully executed that the acts of something as simple as drinking in space are not overlooked. The placement of levers, hatches, and equipment used never give us a moment to doubt its credibility. Most impressively, the destruction brought on by 21,000-mph pieces of debris tearing up a ship like wet toilet paper are delightfully on target with how it would really be (without explosion sound effects, although the trailer has some). We get to see the expertise and training of our leads for their roles, which makes their survival not depend on too-crazy-to-believe odds or bizarre improbabilities brought in for the sake of plot simplicity. None of that here. They went the whole mile. And for as little time as we have to get to know our two leads, we know enough about them to view them as people like any other. They aren’t elevated or demoted as to whether or not their lives are any more precious than anyone else’s. We are not manipulated by their being assigned back-stories that make us toy with surmising about where the plot is going to take us. And yet, with all of these advantages, some still might find such a narrow struggle for survival lacking in viewing variety, but what makes any struggle to stay alive appealing is how we view it, not the struggle itself. This will be what makes up for a noted lack of emotional vibrancy throughout. I must say that it is nice to see humans in space without their being chased by aliens. It is also nice to see a film scare us by making us realize the inherent dangers that we can all relate to on earth in exploration efforts, in being the proverbial “fish out of water” in the icy cold depths of space. Sometimes the things we have to fear the most are “acts of god” (a.k.a. nature) and our own ambition to see new things. This may not be Bullock’s best role ever—indeed, it was Clooney who seemed to carry a more natural adoption of the personality for his role than did Bullock, but that will not cross the minds of too many viewers. What will is the terror brought on from drifting helplessly in space into an abyss of darkness while awaiting certain suffocation. Off hand, I cannot think of any other films that exploit this fear (much less do it as well). And in this case, the subject matter alone makes it a must-see. Even if you don’t like 3D, you might consider seeing it that way since the reports are almost replete with the message that it adds to the visual buffet.